JOHANNESBURG – Zimbabwe's largest workers union, the Zimbabwe Congress of Trade Unions says the country’s unemployment rate is now at 90-percent. The unions said a change of leadership is the only solution to the country’s economic crisis. Addressing the workers day celebrations in Harare, Zimbabwe’s main opposition leader Morgan Tsvangirai said President Robert Mugabe’s government has destroyed the life of the majority of workers. He said Mugabe won’t accept defeat in next year’s elections. 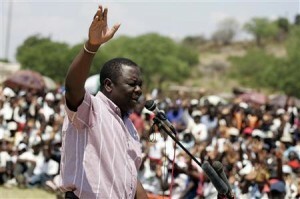 Tsvangirai says it’s clear that the nation is fed up with the 93-year-old leader. He says the country has been turned into a nation of street vendors. Currently, most companies are shutting down in Zimbabwe. Mugabe has blamed the economic crisis in the country on sanctions imposed by the west. I do not think anyone thinks workers. Worker rights have become a problem in all countries. Even in developed countries, workers can not get their rights. The work of underdeveloped countries is very difficult.